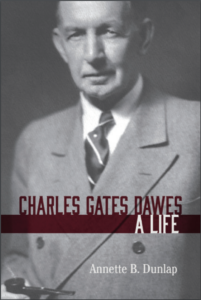 Charles Gates Dawes: A Life is the first comprehensive biography of an American in whose fascinating story contemporary readers can follow the struggles and triumphs of early twentieth-century America. Ebullient and irrepressible, Dawes is most known today as vice president of the United States under Calvin Coolidge, but he also distinguished himself and his hometown of Evanston, Illinois, on the world stage with the 1925 Nobel Peace Prize. Annette B. Dunlap recounts the story of this original American who enlightened and enlivened his world. Charles Gates Dawes: A Life can be purchased at the Charles Gates Dawes House bookstore, 225 Greenwood Street, Evanston, IL. Paperback: $24.95, Hardbound: $40.00. Charles Gates Dawes: A Life was published in cooperation with Northwestern University Press and with generous support from the Tawani Foundation. Read more about the book by clicking here. First published in 1921, A Journal of the Great War provides a fascinating glimpse into the challenges faced by the American Expeditionary Forces (AEF) during the United States’ 18-month involvement in World War I. Dawes’ journal, written while he was stationed in France from August 1917 to July 1919, offers a behind-the-scenes look at the power struggles and political maneuvering that took place among American and European political and military leaders as they sought to fight the war as an allied force. Part document of life in wartime France, part war diary, and part mentation on the means of exercising power, Dawes’ journal is a unique contribution to the literature of World War I. The new edition, edited by Jenny Thompson, includes two new essays, photographs, and more. It is now available on Lulu.com. The price is $25 plus shipping. All proceeds benefit the Evanston History Center. Timelines is the member newsletter, which is sent to membership bi-annually. Past issues can be viewed with the links below.